Unless you have been hiding under a rock, you would know that Apple has launched the iPhone 5 C in pretty, shiny colours which include green, yellow and pink. Well, the similarity of these phones, colour wise, to Nokia’s Lumia range has not gone unnoticed. 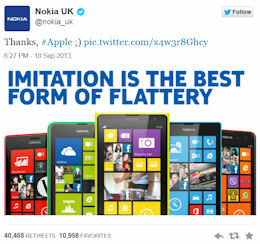 Nokia was quick to send out this tweet with thanks! The tweet was then retweeted over 8,000 times in less than just 20 minutes. As per this story in The Drum the tweet has since gone viral with 38,000 retweets. A Twitter staff member has also confirmed that they put it in the top echelons of marketing tweets in the site's history. Well, this story, strictly speaking, cannot be called Bad PR or Great PR. But it is an extraordinary event in the history of India’s public communication that shows how the presence of multiple channels of communication can tempt people into saying and doing things they may never have said otherwise and perhaps should not have said. Without going into whether the allegations against former army chief General VK Singh are true or not, the report leaked to Indian Express and the counter interviews given by General VK Singh are extraordinary. Never before has any retired army chief ever made such startling revelations about how the Government and army operate in the context of what are alleged to be covert operations. The kind of strident questioning undertaken by channels like Times Now, and the kind of answers given by General VK Singh is a sign of how far our media and public has travelled from the old days of state controlled TV news. This is truly the age of communication, but whether such open communication is always helpful is another issue. Robert Vadra poses for luxury magazine in an astonishingly bad PR move! Now, this is such an astonishingly bad PR move. Even as allegations of land deals favouring Robert Vadra, son in law of UPA Chairperson and Congress party President Sonia Gandhi, continue to swirl, Vadra instead of keeping a low profile has chosen to pose for the cover of Le CITY Deluxe India magazine. Vadra talks about his sartorial choices (Zara Man and Diesel) in the magazine and according to Indian Express in an unbelievably naïve statement says: "You might be with the first political family of the country, but you'd still need to step out and knock on doors to create your own business and life." I don’t see many people buying that. While the Gandhi family is adept at keeping a low profile image, the skill seems to escape Vadra. In his last public communication in 2012 he helpfully expressed his views on Facebook saying these “ Mango people in a banana republic”, a reference to the Aam Admi party. The resulting furore forced Vadra to delete his FB page. The irony of Sonia Gandhi pushing massive welfare bills such as basic food security as Vadra poses for luxury magazines cannot be lost on people and is not likely to win him any admirers.